Preheat the oven to 325 degrees. 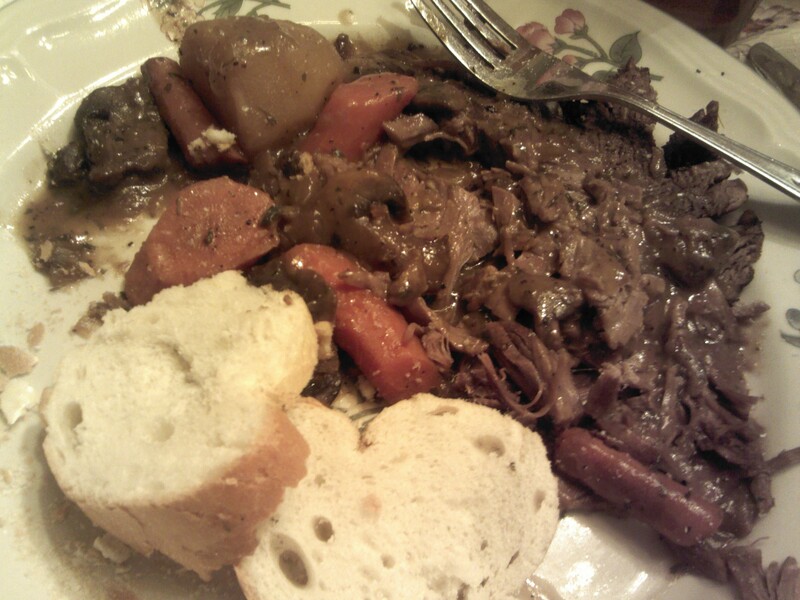 Wash and pat dry pot roast. Season liberally with kosher salt and coarse ground pepper, covering the surface. Heat oil or fat in a cast iron skillet and brown roast on all sides. Saute onion, mushroom, and green pepper in the pan drippings and place on and around roast in a Dutch oven. Season with sprig of thyme and bay leaf or bouquet garni. Add wine and stock. Cook for 90 minutes, checking to see if the meat is getting tender. Cook for another 20 minutes after basting with the juices in the Dutch oven. Add the carrots and potatoes and cook another 35 minutes. Remove from heat and allow to rest. Allow to set. Remove the roast and the vegetables, keeping them separate. Skim all the fat you can from the surface of the remaining stock and discard, along with the bay leaf and herbs. Drain resultant stock into a saucepan, and bring to a simmer. Stir the kneaded margarine/butter into the pot and allow to thicken. Add a pinch of kosher salt and pepper to taste. Keep stirring until even. Sweeten just a little with a teaspoon of honey. Slice roast into one inch thick slices and place on a ceramic platter surrounded by the onions and carrots. Spoon mushrooms and onions remaining over the meat and then top off with the gravy. Add the parsley and serve with a fresh warm baguette or sweet corn muffins and a dark green, leafy salad. Nice blog, Michael – I live and work in Burundi, and in the past worked in many other African and Middle East countries in agriculture and livestock training. My blog has a good many entries on agriculture and cuisine of the areas in which I’ve worked. Thank you Diana! I love your blog and now I’m following you!